A questionnaire script that’ll make data collection a breeze! Have you ever needed to create and run an online questionnaire? This could be useful for a college project, or for market research and gathering customer feedback. Well, whatever the occasion, phpQuestionnaire is a handy online survey script that’s sure to deliver the goods. Without further ado then, let’s dive straight in and take a look at the user demo provided on the Chumpsoft site. 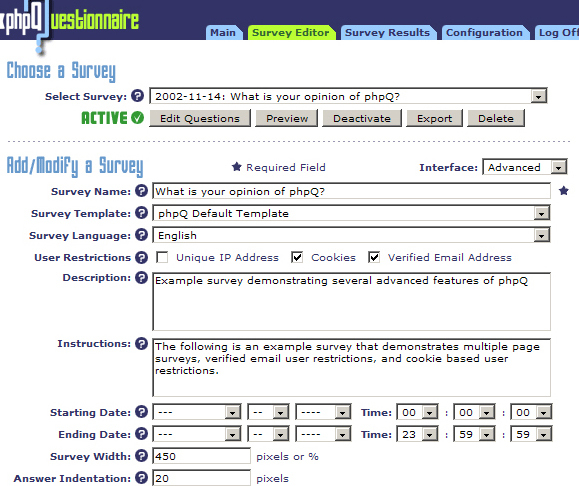 First off, phpQuestionnaire gives the option of creating and storing a number of different online questionnaire scripts. The layout of the survey software is simple, clean and professional, while the questionnaires themselves take a number of different forms. This three-page demo questionnaire is extremely easy to navigate – questions take the form of multiple-option check boxes, or text accompanied by answers that can be picked from a drop-down menu. On completion of the final page of the questionnaire, users are invited to enter their email address. This will allow a confirmation password to be sent to their inbox, and they can then enter this password into the box on the next page to officially complete the questionnaire form. The plus side of this is that you – the webmaster – will be left with a comprehensive email list of your successful participants. “Chumpsoft Logo Poll” showcases a slightly different kind of design, whereby users are asked to vote for their favourite – and least favourite – out of a series of varied images. This simple, visual format is going to work well for anyone looking for feedback on a piece of design work, as in the case of this example. This format also introduces the notion of allowing users to check the results of the online poll so far. “Design Contest Poll” is much the same format as the above, although here Chumpsoft take the opportunity to show us another customised design – the brown background and stylised border replaced for a clean, white layout. Finally, both “Sample Survey 1” and “Visitor Demographics” take us back to the simple, text-based survey scripts of our first example. It’s not particularly exciting, but then it doesn’t need to be – this is a smooth and efficient survey script that’s been designed for ease of use and no-frills functionality above all else. So, that’s the user experience in a nutshell. Now we’re going to go behind the scenes, and find out exactly how easy it is to set up and manage your questionnaires through phpQ. The back end of phpQuestionnaire looks rather a lot like the front... except this time, our smart list of available questionnaires is each accompanied by the kind of stats and additional info that webmasters are going to need to know. Namely, we’re able to look at the total number of responses each survey has so far received, and a description of the survey that will be offered to potential candidates. Links are provided to both the survey itself, and to its public results. Finally, we’ve got two buttons labelled ‘Edit’ and ‘Preview’ respectively... and it seems a fair guess that this is where the magic happens. Hitting the ‘Edit’ button takes us directly to the Survey Editor, a comprehensive screen that allows admins to create their own tailor-made online questionnaire forms – and there’s plenty of scope here for customisation. Some of the basic fields that can be completed include survey name, description and instructions. A drop-down menu labelled ‘Survey Template’ will let you choose from a range of 13 different design styles for your questionnaire, while a language can be chosen from a menu featuring English, French, Spanish and Dutch. The really clever part comes next, with a long list of fields that will allow you to set up the style of your survey script, enter you own questions, and specify the number of pages along with a preferred submission process. It’s all very straight-forward, so let’s not get too lost in those details here – suffice to say, it’s easy to see how the process works, and pretty soon you’ll have your online questionnaire up and open to the public. Last of all, two other tabs at the top of the Admin page – besides ‘Main’ and ‘Survey Editor’ – will enable webmasters to check survey results, or modify the overall site configuration. You can buy your own copy of phpQuestionnaire over on the Chumpsoft website. A single site license retails at $199.00, with a second year of upgrades and support that can be added on for a further $99.00. On the other hand, those looking for a quick and easy script for a single online questionnaire can pick up phpQ Jr. for just $59.00. A range of options for full customization. The script offers no real surprises, and nothing beyond the basics. Chumpsoft’s phpQuestionnaire will do exactly what you need from an online questionnaire script – collect data, save a list of user emails, and arrange the results for easy viewing. And that’s pretty much all it does! If questionnaires and data collection form an integral part of your business, then perhaps you’ll consider the rather high price to be well justified... but then again, the reduced-price, “lite” version may come as a handy alternative for those just looking for one single questionnaire script. Richard Morten - Richard Morten is a freelance writer and self-confessed geek. 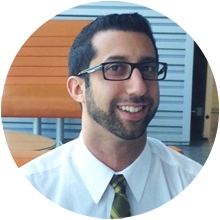 His interests include travel, coffee, and spending way too much time on the Internet.